On Tuesday, May 31st, Jean will talk with Tissa Hami, an Iranian American female comedian, and Dean Obeidallah, a Palestinian-American/Italian-American comedian. Both use comedy to break down the stereotypes about Muslims, Arabs, and Islam that have surged after 9/11. Can Comedy and Religion Go Together? In a world where religion is part of so many conflicts, some have found ways to bring people together and force them to address their stereotypes. Comedy is one way to achieve this goal. Laughing together can create a sense of understanding across differences. 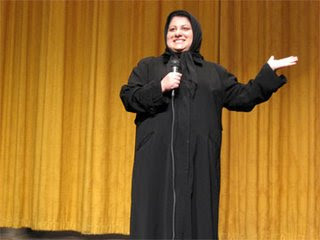 While some may people may not associate the two terms “Muslim” and “comedian” (or even “religion” and “comedy”), there have been many Muslims like Azhar Usman, Mo Amer, Preacher Moss, Maysoon Ziad, Tissa Hami, who have used comedy as a way to break stereotypes and to make the audience appreciate their differences.